A healthy twist to a basic banana bread recipe. Tempt My Tummy Tuesday…. Basic Banana Bread made healthier! I know we all have a “go to” recipe for banana bread. I have one, myself. However, it is always nice to try a new recipe, especially if it is a little healthier for you. As many of you know, I am working toward a more healthy lifestyle, including healthier eating habits, and working out with a trainer, several times a week. I am starting to see results, and it is exciting! So, for that reason, I thought I would share this new version of an old classic. 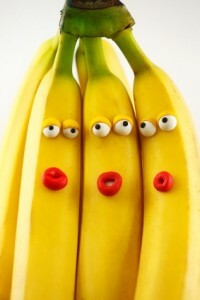 Silly Bananas to make you Smile! Combine first 4 ingredients in a large bowl; beat with a mixer at medium speed. Add granulated and brown sugars; beat until combined. Weigh or lightly spoon flour into dry measuring cups; level with a knife. Combine flour and next 5 ingredients (through ground allspice). Add flour mixture to banana mixture; beat just until blended. Pour batter into a 9×5-inch loaf pan coated with cooking spray. Bake at 350 for 55 minutes or until a wooden pick inserted into center comes out clean. Remove from oven; cool 10 minutes in pan on a wire rack. Remove bread from pan; cool completely. Combine powdered sugar and milk, stirring until smooth; drizzle over bread. Yield: 16 servings (serving size: 1 slice). Do you have a healthier version of an old classic? I would love to hear about it. And, as always, thank you for participating in Tempt My Tummy Tuesday. I love banana bread! The inclusion of flaxseed is a new and healthy twist I will have to try (I am always trying new versions of this recipe!) Thanks for sharing and have a blessed week! I love the addition of the yogurt in your bread. I am going to give it a try it looks so good. Thank you for sharing your recipe and hosting every Tuesday. Lisa…this looks yummy. I love the addition of flax seed and use it in lots of different baked goods. I love banana bread–it’s nice to have this healthier version to try! I have a healthy recipe that uses all whole wheat flour and I’m loving the idea of adding flaxseed!! Sounds great! That would be great to make for my son to have before practice! Thanks for sharing and for hosting my friend! this sounds great, I have to try it! Love the yogurt and flaxseed in here! Sounds good, thanks! Thanks for sharing your banana bread recipe. I too have been looking for a low sugar recipe. I like replacing the oil or butter in a recipe with applesauce. I actually think my recipes turn out lighter and fluffier when I do this. This looks great, I’ve started putting flax in a lot of things, I like the texture it gives. Always love a healthier version! Thanks my dear. That’s a wonderful healthy recipe for banana bread, and it sounds very tasty too! Well done for all your hard work in the gym – you should be very proud of yourself! Unfortunately my recipe is not all that healthy this week, although it does have blueberries in it, so I suppose that counts for something 🙂 Thank you for hosting and have a lovely week! Banana bread is one of my family’s all time favorites…….they’d be thrilled if I made it every week!! I’ll need to try your version some time!! Your banana bread sounds yummy! I love the sill bananas, too. Sorry I linked twice! A good indication I need more coffee! All the recipes look great! Thanks for hosting, Lisa! I can’t wait to try this recipe, always wanted to make banana bread. I never use allspice in my banana bread. I will add that next time. I also add yogurt/sour cream to mine. It makes the bread very moist. What a great recipes link up! Thanks for all these yummy new recipes. I have a thing against soft white food including bananas, so I wouldn’t like this. My mom however LOVES banana bread. I’ll pass this recipe to her because she’s been looking for ways to make her old favorites healthier. Thanks for hosting the party.